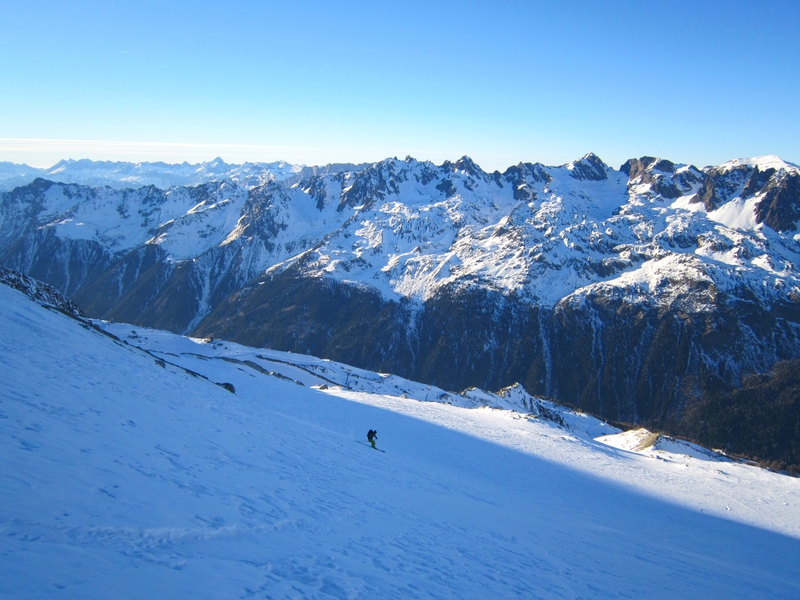 Yesterday I skinned up from the Bochard gondola at Grand Montets towards the top station, Upon reaching the col on the left hand ridge I changed to crampons and scrambled up the rocky snowy ground towards the top station at 3300m. 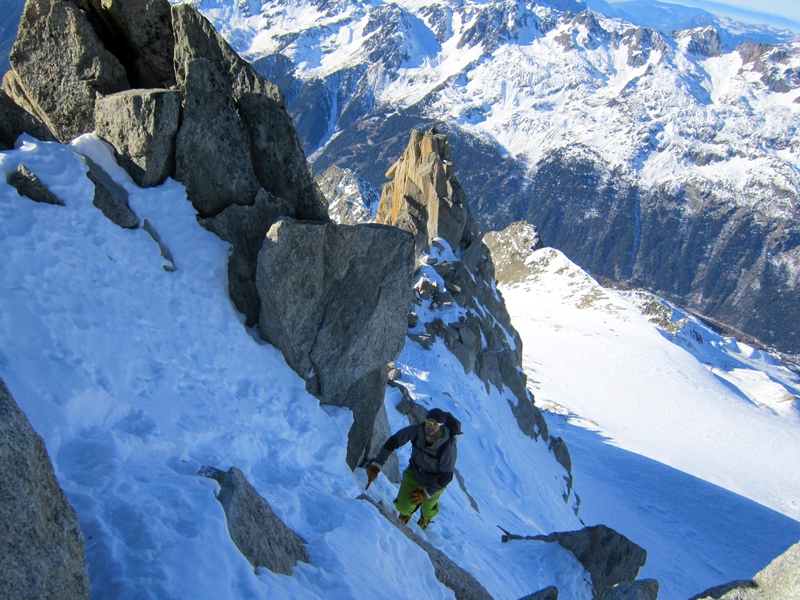 This was good fun and I was keen to go that bit further and continue up to the summit of the Petit Aiguille Vert. Deciding against it at the last minute I headed back down. 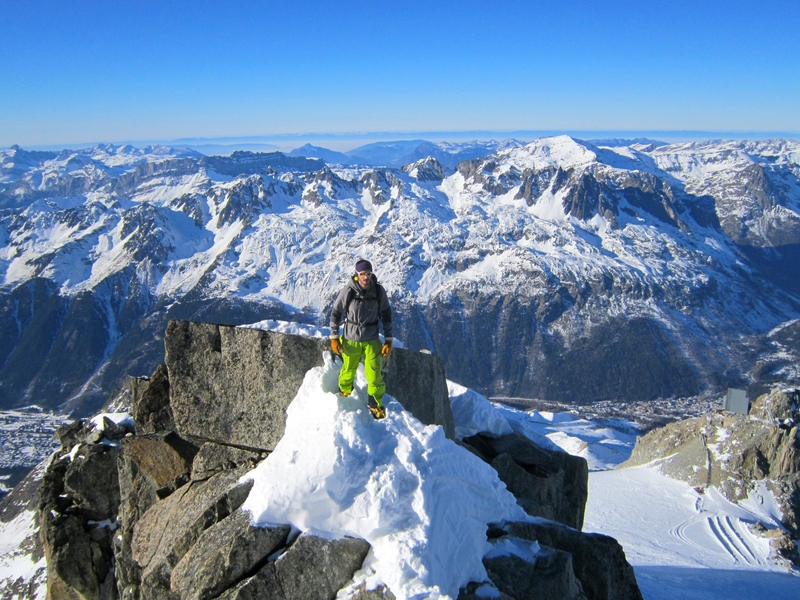 Alone on the summit of the Grand Montets. 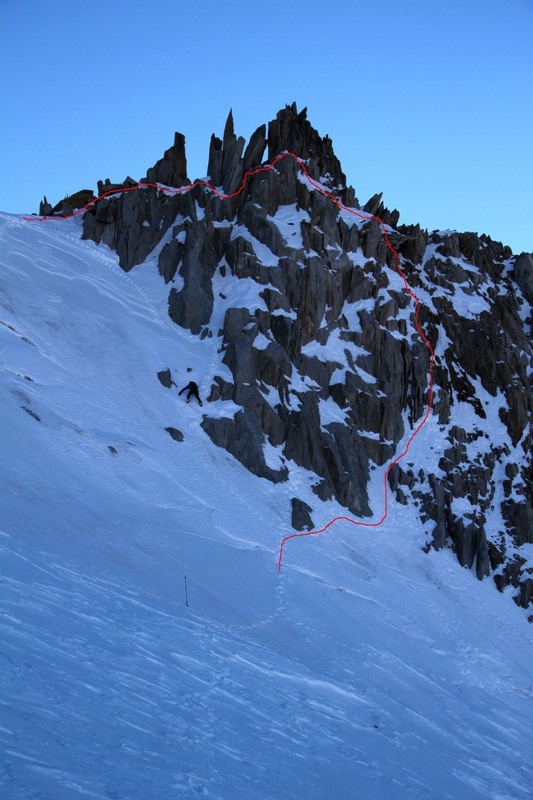 Going back up with Ally Hurst today the plan was to repeat what I did yesterday and then climb the ordinary route on Petit Aiguille Vert. After getting the second bin up GM at 9:30 we were on our way up the Bochard Gondola and soon we had skied the short traverse to where we would skin from. 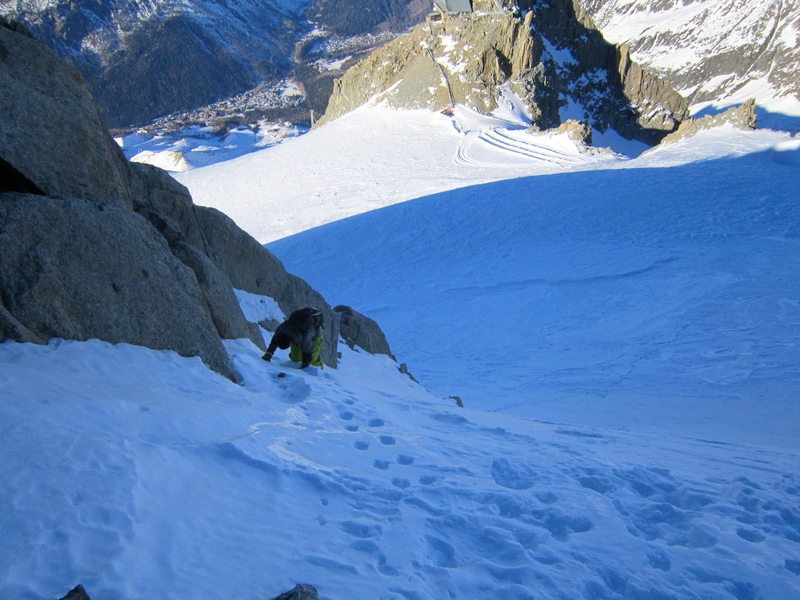 It took us just under an hour to get to the Col du Rachasses, 3037m, from here we changed to crampons and continued up the north ridge of the Grand Montets towards the viewing platform on the summit. 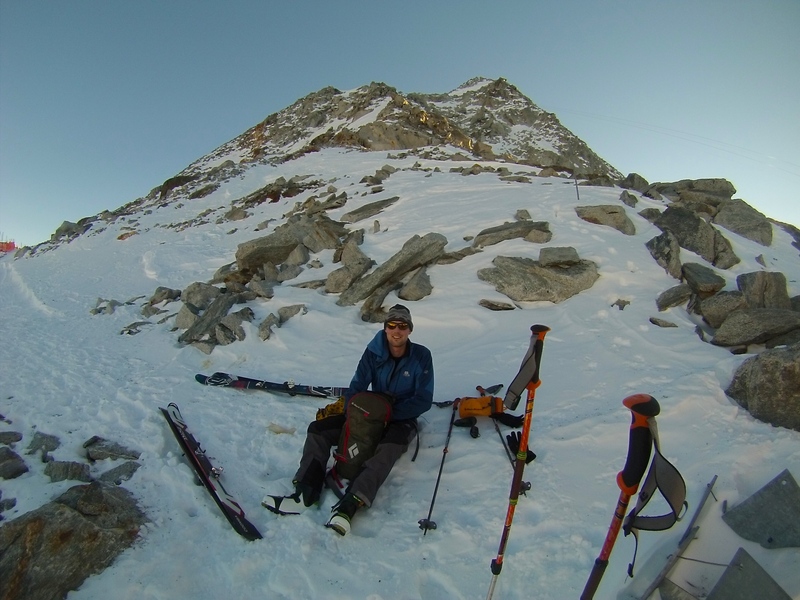 Ally Changing into his crampons with the North Ridge of GM behind him. You can see my track from yesterday on the right. 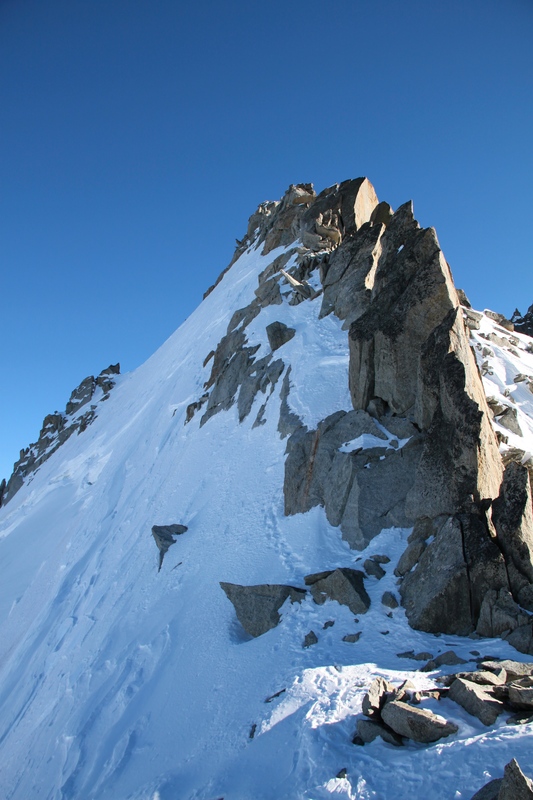 This ridge is very similar to the first section of the Cosmiques Arete and is good fun and relatively easy with a few moves thrown in for good measure, maybe grade 3/4. We flew up the ridge in under an hour with about 250m height gain. 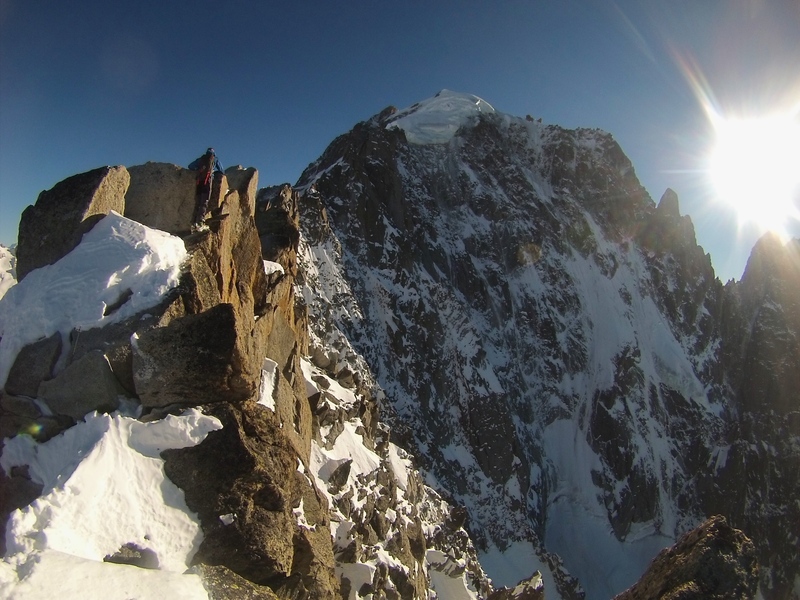 Pausing on the summit for a few minutes we then headed down the steps that lead out of the back of the top station and started up towards our main goal, Petit Aig. Vert. The red line indicates our route to the summit, We came down the same way apart from near the Bergschrund, I will say why later. We made quick progress up the snow slope but then hit a problem at the Bergschrund. 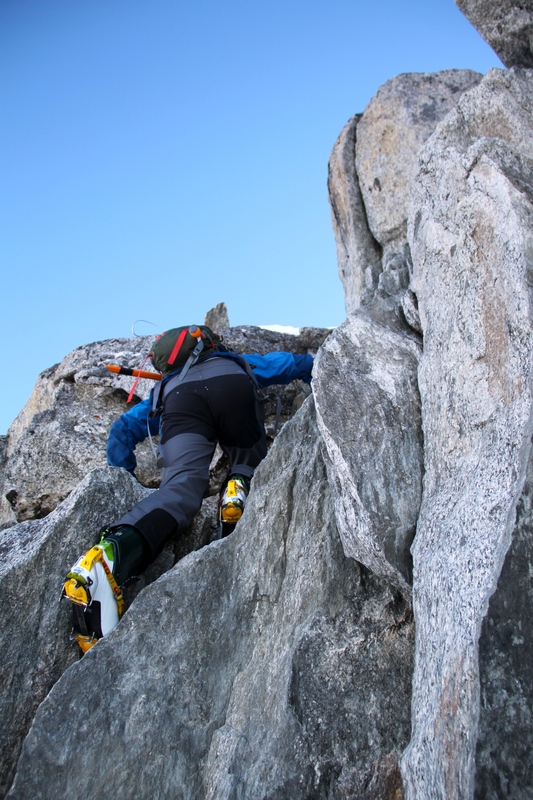 Ally found a way over but on the other side was 50′ bullet hard black ice, this would not normally be a problem with two axes and a rope but we only had one lightweight mountaineering axe and no rope, harness or anything! After I ran up the steep slope another 30m and found no other way across, Ally came back down and we started to look for another route up. We eventually decided to climb up the mixed ground to the right of the normal way up to avoid the ice and this turned into somewhat of a challenge. The above photo shows the way we went up in red and Ally down climbing the way we didn’t feel would be easy going up. 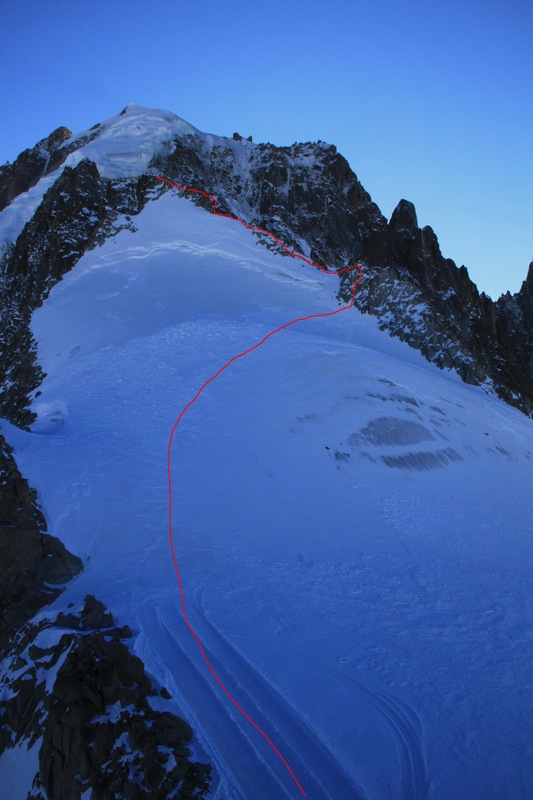 The route in red we took was harder than the exit couloir on the Cosmiques Arete and coupled with loose powder snow and no protection it felt like AD or even D grade, and for some reason I went up first, clearing the snowy ledges as I went. Next time ill send Ally up first! Once we were through this mixed ground and onto the main ridge it went quick and it was pretty easy going. Following the obvious ridge to the left of the rocks you follow a series of snow slopes and small mixed steps to come to a short but steep rock move up to the summit ridge. Ally freeing it up the upper rock section, Some tricky moves to make without a rope! Once over the rock section there was some more mixed ground and snow ridges to get to the summit. 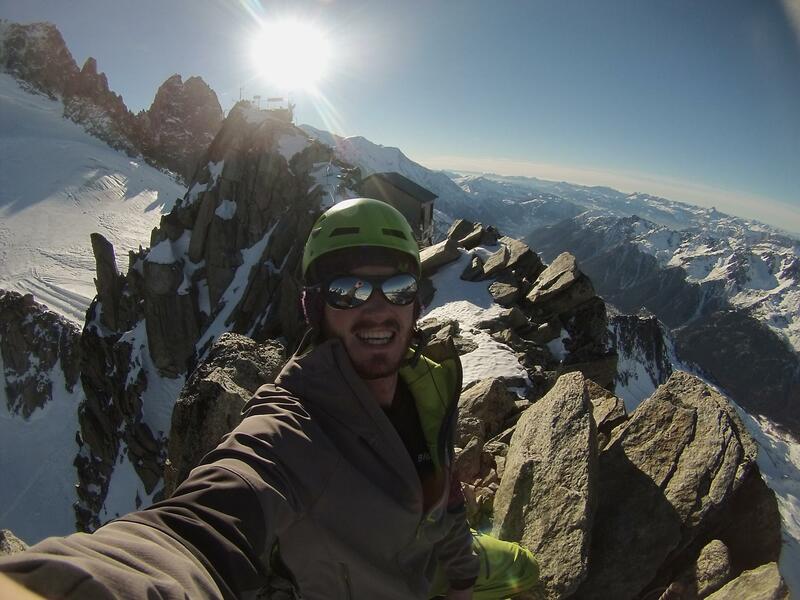 Ally is one step away from the summit here, with the Aiguille Vert to his right. After reaching the summit there are two ways down. In the summer me and John Vincent rappeled down the north face with 3 50m raps. With no rope Ally and I had to reverse the whole route, Down climbing in soft sugary snow was somewhat precarious but we made quick time. We had no problems and then when we came to the section of ice above the Bergschrund I went down first kicking in big steps in the snow until we got to the ice then it was front points only for the last 20m. After getting past this section we were down and back at our skis within 25 minutes. Getting our skis back on we headed down the north face towards the upper slopes of the Bochard and found some nice sections of soft snow, then down some steepish couloirs we had some nice chaulky snow to finish. All together another great day climbing and skiing up at Les Grand Montets. Some powder would be nice now! Thanks to Ally for the company!